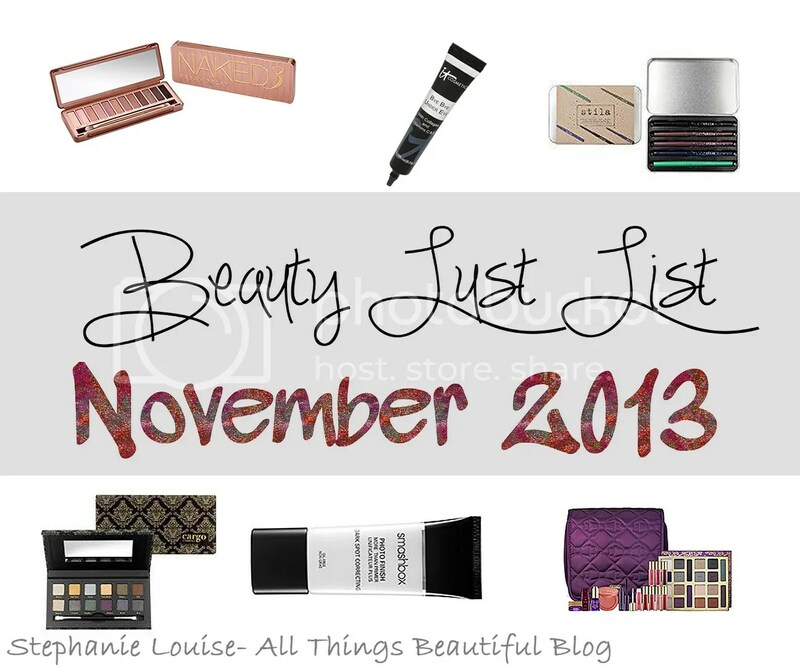 November 2013 Beauty Lust List + Update featuring Tarte, It Cosmetics, & Blogger Enablers! Is November seriously over? I know a lot of people complain about time flying but holy smokes I must have conked out for like 2 weeks! I’m a day late because normally I try to post my monthly Beauty Lust List on the last day of the month but…hey I spent the holidays having fun! Anyway this month I don’t have nearly as many things on my wishlist because I’ve been totally spoiled the last few weeks in general. Check out what I’m lusting after, what I got off my list from last month, & which bloggers/vloggers have me yearning for new beauty finds! From my October 2013 Beauty Lust List which you can see here I only picked up one item, go me! I absolutely caved & had to have the Lorac Pro to Go Palette. I even reviewed it here on the blog– hint…I love this so much! It is very “me” in terms of shades & the packaging is just so far out cool. Really, check out my review! The Tarte of Giving Collector’s Set & Travel Bag– I’ve wanted this since I first saw it honestly…it comes with a TON of stuff. Makeup Geek (Marlena) actually gives an excellent in depth review which I’ll talk about below. I’ve been wanting a bag juuuuust like this for travel & everything inside looks like items I’d use. Palette, lip, cheek, eye, skincare… this is an amazing set that is available from Sephora for only $59 with a whopping $490 value. I’ve honestly never seen anything like it! 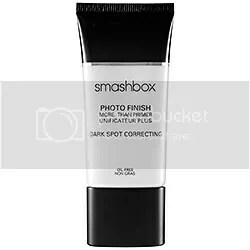 Smashbox Photo Finish More Than Primer Dark Spot Correcting– Um hi, I’ve never heard of this? I was watching a video on youtube (Ingrid aka Missglamorazzi) & apparently she hadn’t either until she saw it in the Sephora store. I have some hyper pigmentation & I love my Smashbox primer so this is definitely on my list! It Cosmetics Bye Bye Under Eye Anti-Aging Concealer– I’ve heard nothing but good things about this & especially lately my undereyes are so dark. Apparently sleeping isn’t absolutely necessary because I’m functioning with very little. I really need to get my hands on this! I need it in the lightest shade, someone had this in a set but it was in medium. I cried a little. Cargo Let’s Meet In Paris Eye Shadow Palette– After totally falling in love with this Cargo Vintage Escape palette which I reviewed that was also limited edition I can’t help but want this one too. So pretty, so rich, lovely packaging…what else can I say? I’m lusting after it…but I have so many palettes I’m still try to decide if I need it. Who am I kidding? 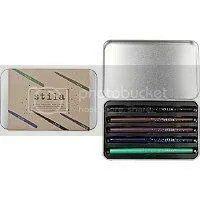 Stila Color Outside The Lines Smudge Stick Waterproof Eye Liner Set– So basically this set is available for only $25 from Ulta online & includes 5 Stila Smudge Stick Eyeliners. Normally…one of these eyeliners alone retails for $20. What isn’t to love about this set? You get a pencil in colors that look black, navy, bronze, aubergine, & emerald. I need this in my life…especially on sale! Urban Decay Naked 3 Palette- I’m thinking I’m one of the few who is still completely undecided on this one. I love the tones in this palette, I don’t have a palette quite like it either. But I’m not sold. Some of the reviews I’ve seen just don’t blog me away pigmentation/texture wise but I do love the packaging & overall look. I reach for my Naked 2 more than my Naked 1… but my Lorac Pro totally blows them both out of the water so I’m still unsure. Thoughts? This is sold out all over so I still have some time to ponder anyway! Slashed Beauty Blog– She gave me an awesome tip about the ELF 50% off everything from the Studio line here on her blog! Fabulous, I got a good chunk of items since I usually buy fromt he Studio line anyway & I’ve been overdue for an ELF haul. She also posts about everything from nails to makeup so definitely check her out! Bon Vivant Beauty– This isn’t so much of a “hey go buy this!” as a “hey I own this why aren’t I wearing it right now?” type of enable. I’ve had SO many polishes out to swatch & review that I’ve put aside some that came out months ago that I adored for this season- case in point Zoya Chyna which I reviewed here. Look how beautiful her post is, & she even labeled her doggie Lily, how totally adorbs is that? Liesl Loves Pretty Things– She has me searching EVERYWHERE for the gorgeously textured L’Oreal shade on her nails! Check out her post here, it is absolutely beautiful (as usual on her blog!) & this color & glitter combo speaks to my soul. Must. Find . This. Polish. Don’t blame me, blame her if you happen to be hitting every local drugstore after reading. The Plastic Diaries– What do mean there is a NEW Tangle Teezer??? Here she has photos & a review of this new (to me at least, i have the original which I love to use in the shower!) on her blog here! Although Kimmi isn’t crazy about the shape I just might give it a go since I drop the other brush constantly! Makeup Geek Blog/Video– The Tarte of Giving Collection was on my list before, but she totally convinced me I needed it in my life. Check out her review/swatches on her blog, her video review, & her palette smackdown for 2013 which is one of my most looked forward to videos from her every year! See? Not nearly as many items on the list this month! Perhaps just maybe you have some more for me? If so, leave them below! There is always room on the Beauty Lust List for more things to love & want! Ipsy Glam It Up Bag for November 2013 featuring EM Cosmetics, Nailtini, & More! Beauty Box 5 for November 2013 featuring Aveeno, Secret, & More! Beauty Box 5 for June 2013 featuring Brazen Cosmetics, Aveeno, & More! Beauty Box 5 for April 2013 featuring Model Co, Brazen Cosmetics, & More!